Therapeutic apheresis procedures involve medical blood purification methods for the removal of pathogenic constituents of blood or of blood plasma (e.g., blood lipids). Apheresis proceeds outside the body; the ‘purified’ blood is redirected into the patient. 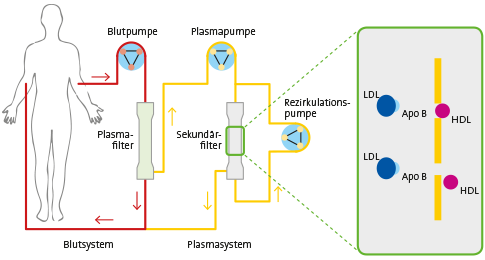 The following methods are used in our centres: cascade filtration, utilizing devices from the company Diamed®, and the DALI® or MONET® method, utilizing devices from the company Fresenius®.